We are in the home stretch for Workshop prep so this Challenge has a working kind of theme, this week, we are working on a name tag lanyard. This pattern is special to me cause it is the first thing I ever shuttle tatted. It was my first Guild meeting and Lois showed me how to do the elusive “flip” maneuver and sent me on my way. it is a perfect purse project because all the thread and beads are on the shuttle and if your shuttle has a hook, it is an all in one piece. You will need a large shuttle to hold all the beads and thread, I prefer the Tatsy. I have modified mine to include a hook before I decorated it. As it gets longer, I use a diaper pin to keep the length under control. 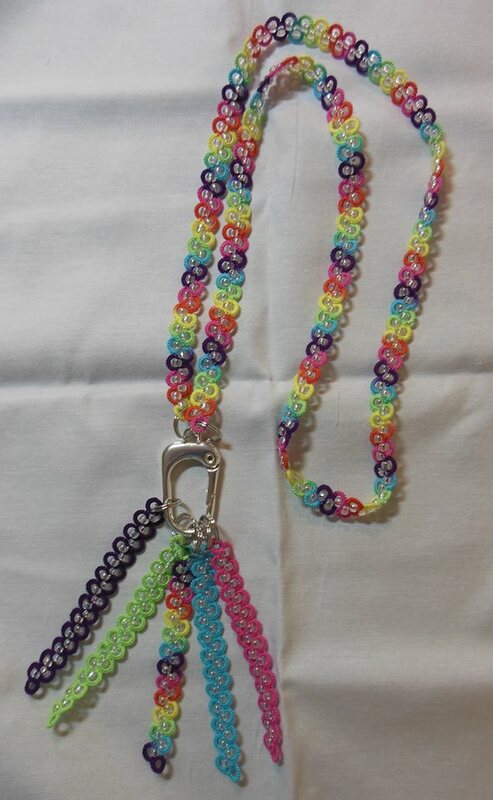 Each Lanyard takes about 300 size 6 beads and 25-30 yards of size 20 tatting cotton. I made mine with a mixture of pink beads and Lizbeth 20, 621 Dusty Rose. This pattern is written by ShuttleBirds’ President, Patti Duff. 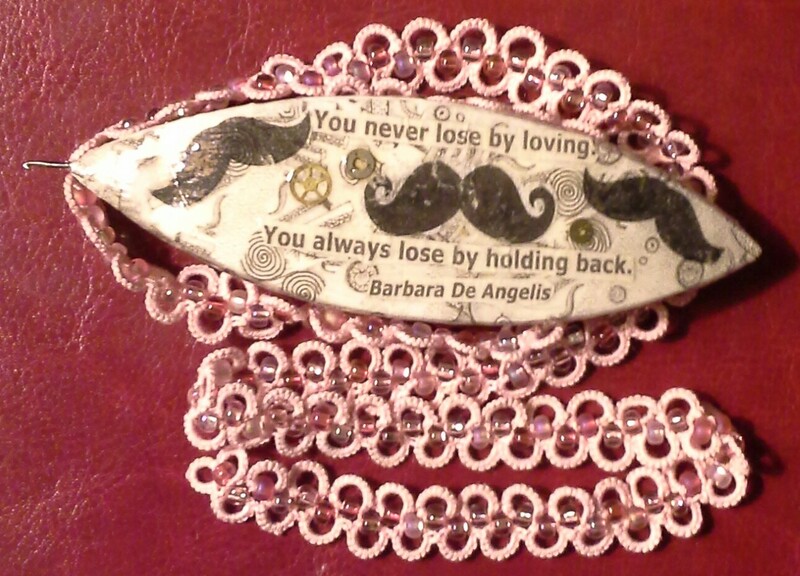 She doesn’t have a web site but you can reach her thru the Shuttlebird Tatting Guild. We thank her for letting us use her pattern here. 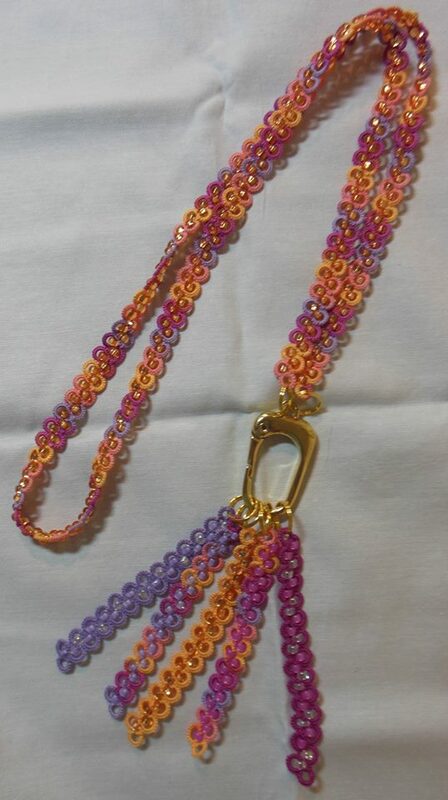 You can download the PDF file Beaded Lanyard. The two chatelaines to the left are variations of this pattern and are part of the scholarship raffle at workshop. They are made from Lizbeth 20; 139, Fruit Fizz and 184, Rainbow Splash. You can be part of our raffle by contacting Natalie or myself for ticket information. We hope you enjoy making yourself a lanyard and for all of you guild members who made theirs last year, send in a picture so we can add you to the gallery. 1. the mistress of a castle. 2. the mistress of an elegant or fashionable household. 3. a hooklike clasp or a chain for suspending keys, trinkets, scissors, a watch, etc., worn at the waist by women. 4. a woman’s lapel ornament resembling this. What Size Crochet Hook Do You Prefer?